In the middle of the upper Egyptian old town Esna, you will find the temple of Chnum 9 metres below the land level of the surrounding city. The holy deity of the ram headed God Chnum is Lord of the Nile cataract and all of it's waters. 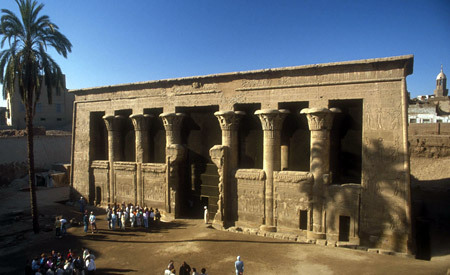 The Ptolemaer and the Romans have built the temple; therefore you will find roman caesers on the throne of the Pharaohs around the temple complex. The pillar capitelle are gold plated and show exotic flours and plants and hieroglyph cartouches. On the ceiling paintings you can see the whole cosmos known then with the sun, the moon and the stars.